At Nickerson Company, we work with just about any type of centrifugal pump you can imagine, big or small, new or old. Most centrifugal pumps are built with future repair in mind. It’s no surprise then that often our customers are using older pumps that, when repaired with a few custom-fit parts, can be restored to original specifications and continue to serve their businesses well. Our expert machinists work in two capacities. One is to create precision parts to restore the performance of an older pump and keep it working perfectly for many more years. The other is to create new parts to replace worn out parts, or build brand new pumps. Machining is the process of subtractive manufacturing, which is taking a larger piece of material and reducing that material down to exactly fit the specifications of the blueprints. Turning (operations that rotate the work-piece as the primary method of moving the material against the cutting tool), milling (operations where the cutting tool rotates), and drilling (operations in which holes are produced or refined) are the primary processes of machining. At Nickerson we work with cast iron, steel, bronze, and stainless steel both in bar stock and cast forms to create new pump parts. Often times we can create replacement parts in upgraded materials that greatly increase the runtime of our customer’s pumps. 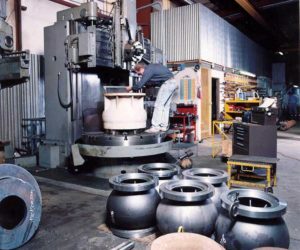 Some machine operation is done on manual machines, while others utilize computer numerical control (CNC) machines, where computers are used to control the movement and operation of the mills, lathes, and other cutting tools. An experienced machinist runs computer numerical control machines. The machinist utilizes an expert eye to produce a final part, which is then used to repair a pump. Among other uses, we utilize CNC machining to create pump parts when there are multiple parts matching the exact same specifications. This speeds up the process and ensures a beautiful fit. Our machinists working on manual machines create particularly unique parts or parts where only a single unit is needed. All of this work takes place in our extensive machine shop complete with a stock of durable materials and a roster of modern-day machines necessary to get the job done. As with any other aspect of Nickerson, Co., we take great care to work with our customers to find the best solution for them. Whether we are building a brand new pump custom fit to a facility’s needs, or repairing a perfectly good, older pump by restoring critical clearances, our machinists pride themselves on their ability to tackle any challenge. To learn more, please visit our machine and fabrication repair pages.